Organic Plant Food. 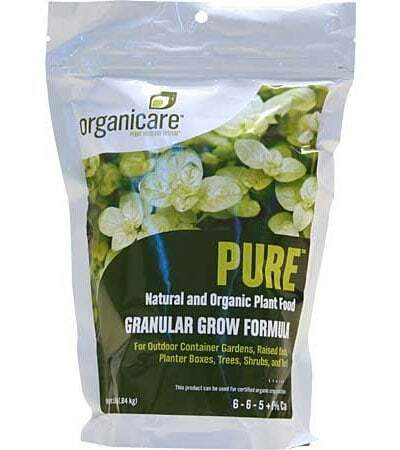 Pure Grow Formula (6-6-5 + 8% Ca) is the base for the Botanicare Plant Nutrient System. Contains major growth promoters like fish meal and seaweed with composted poultry litter, alfalfa meal, sulfate of potash, macro and micro minerals, amino acids, proteins and natural plant extracts to create a highly effective fertilizer and growth stimulator. Granular formula is easy to apply. OMRI Listed for use in organic production. Available in 1.6 lb and 5 lb sizes. Soil: Prior to planting or transplanting into soil or containers, mix Pure Granular Grow thoroughly with soil, potting mix, coir fiber or soilless media. Mix 1/2 to 1 oz. per gallon of growing media. For best results, use with Organicare Humega and Huvega every watering at 2-3 tsp. each per 4-liters of water. Reapply every 2 weeks by turning 1/2 to 1 oz. Pure Grow per gallon of media into the top 1-3″ of soil. Hydroponics: May be used in conjunction with hydroponic nutrients or other fertilizers. 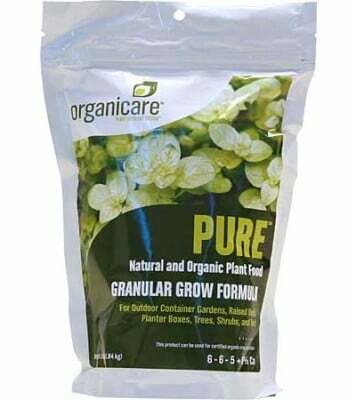 Prior to planting or transplanting, mix Pure Grow at the rate of 1/2 oz. 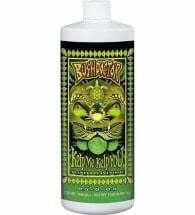 per gallon of grow media for seedlings and up to 1.5 oz. for mature transplants. Reduce nutrient applications by 25-50%. For best results, use with Organicare® Humega at the rate of 1-2 Tbsp. per gallon of water. Use with every watering. 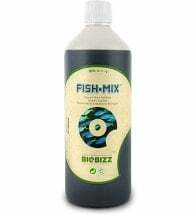 Ingredients: Fish meal, crab meal, sulfate of potash, alfalfa meal, composted poultry litter and seaweed (Ascophyllum nodosum).